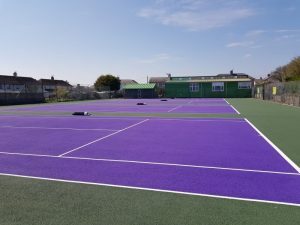 At last the courts have been painted and are available for play from Monday 15th April 2019. The Courts have been refurbished and repainted over the last 6 months as part of a successful Grant Application obtained from the Welsh Government Rural Development Grant to improve the communities sporting facilities on the Recreation Ground. If you are interested in joining Llantwit Major Tennis Club further details are available on their website https://clubspark.lta.org.uk/LlantwitMajorTennisClub or via their email info@llantwittennis.co.uk. If you are interested in just paying and playing please pop into the Town Hall to obtain a key for the courts. Cost £2 per person per hour. Keys are available for collection during Office Hours. Summer is on its way, so time to get on the courts, get practising your serve and get ready for Wimbledon!